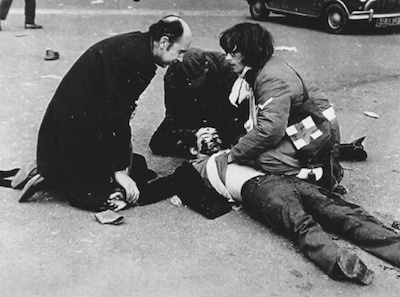 As we approach the 43rd anniversary of what became known as Bloody Sunday, I’m inclined to reflect on how far we have come over four decades. The march on January 1972 was attended by people from all over the north and began as a peaceful civil rights demonstration. That day as we marched we called for parity of esteem, peace with justice and for an end to internment without trial. Other issues raised included the lack of adequate housing, poverty, education and unemployment. Sadly, 43 years on, the issues remain the same despite increased political representation and while there may be a semblance of peace our quest for justice seems to involve endless promises and sham processes. Indeed, 43 years after Bloody Sunday the relatives of those brutally gunned down by state forces still await clarification on whether or not the PSNI considers those murdered on Bloody Sunday as murder victims. The prevarication on this issue alone speaks volumes on the sham that this ‘murder’ investigation has become. From the signing of the Good Friday Agreement numerous agreements and deals have since been underpinned. Deals such as giving increased powers to the covert and dangerously unaccountable MI5 as was agreed by the two main Stormont parties during the Weston Park agreement. The latest agreement known as the Stormont House Agreement outlines ways to deal with the past, the implementation of welfare reform and addressing the issue of flags and contentious parades. Welfare reform will involve savage cuts which will impact on the poorest and most vulnerable in society. The money promised to cushion this financial reform is money which will have to be repaid to the British treasury from the block grant, on top of our already mounting debts. Plans to deal with the past involve information recovery, limited immunity and minimal police investigations. The mechanism to deal with the parades and flags issue will see the dissolution of the Independent Parades Commission and the powers passed to the predominantly unionist Stormont. The main Stormont parties have hailed this agreement as an agenda for better government and a remarkable achievement but in reality this agreement will serve to set us back decades. Over the past four years I have held the privileged position of chief steward in the annual Bloody Sunday March for Justice at the request of the three women at the forefront of the march, Kate Nash, Helen Deery and Linda Nash. On the 40th anniversary of Bloody Sunday these women with other Bloody Sunday family members chose to continue with an annual march to demand justice for their family members and to provide a platform for other victims. I would take this opportunity to invite everyone to join this year’s annual March for Justice which will take place on Sunday at 2.30pm.